(1) What will it take for Rare to return to Nintendo and bring back our favorite croc-stompin' ape? I miss the old-new donkey kong so much! (2) In SMB Bowser was the one who turned all of the people into mushrooms and blocks and stuff right? And he probably was responsible for the disappearance of the king too. Here's the question: are the blocks that Mario breaks the same blocks that the people turned into? And are those people still stuck blocks for the rest of the games? I've got some... interesting ideas for your sweet radio station, WTMK. My first idea is that you could make another radio station and split up the game songs from the different systems like one having GameBoy, NES, and SuperNES, and the other having N64, GC, and the next system (and don't forget the kooky CD songs). My other idea is to have a voting every week that lets people choose their top 10 favorite songs, and then on Saturday and Sunday the 100 most chosen songs would collected and played non-stop. Just for the people who want to hear their favorites again soon. (4) Doesn't it stink that Mario Karty:DD didn't have any old tracks from MK64?! I really wanted to see old tracks like Wario Stadium as a secret course because I love that level and so does my dad, but they stopped at 16 just like last time! Didn't Nintendo have more room to include that fun little track or did they just not feel like it? I just had the craziest idea for a fan fic! What if I wrote a story about all of the staff at TMK going to the real TMK! It would start with Deezer giving up on the website because he's tired of Mario or something. Then at the next E3, the TMK dudes would meet there, hang out, and stay at a motel. At midnight they would sneak back in to the building and... somehow get sent to the mushroom kingdom (I haven't figured it all out yet). There they would meet Mario and help him stop Bowser from his new plot. JJ could turn evil and join Bowser for awhile but then go back to his friends. And Sapphira would get kidnapped with Peach but then beat up Bowser severely. Everyone goes back, Deezer starts up the site again, and the story ends. What ya think? Should I write it? Or is it that bad? Deezer: (1) I really don't think Rare will be returning to Nintendo anytime soon. As for the "old-new" DK, here's what Rare said on one of their latest website updates: DK is doing fine, what's wrong with Donkey Konga? It looks well smart. And that new GBA title King of Swing looks very interesting too. Nintendo know what they're doing, and will do all they can to protect the DK franchise. Unfortunately your ideas would require more time and effort than I want to spend on WTMK. Actually, David has been thinking about setting up a live WTMK stream from his PC. If that becomes a reality, we could take requests in the chat room or something. That would be cooler than most fanfics. Write it and send it in. Please make sure I get a better role than David. MEGAß¥TE: (1) It would most likely take either Nintendo or Microsoft or both giving up on the console wars. However, don't you love Rare's answers: "...we're not doing any DS games, are we? Or are we? Or... are we?" They also mentioned this: "We would be more than happy to make any new game featuring the old ape, but of course the final decision is all Nintendo's." Dun dun dun. Send us lots of money and we can set up a more serious station to do the things you mentioned. (4) Yeah, but there were a lot of other oversights in the game that should have been addressed before that... crappy battle stages, lack of character choice during LAN battles, lack of battle stats, etc. (4) I just wish I had MKDD. We're going to E3 anyway. And why would Deezer get tired of Mario? What is the name of the squid from the SMB games? Is it Blooper or Bloober? I can't seem to find out which it is exactly, even your own site has its discrepancies. So, is there only one name, or is it sometimes Blooper and sometimes Bloober? Thanks! Lizard Dude: I like the sound of Bloober better. Chupperson: What about Gobo, Mokey, and Red? Oh, it was "Bloober" in Mario Party 3, also. ...Oh, and Wembley, too. 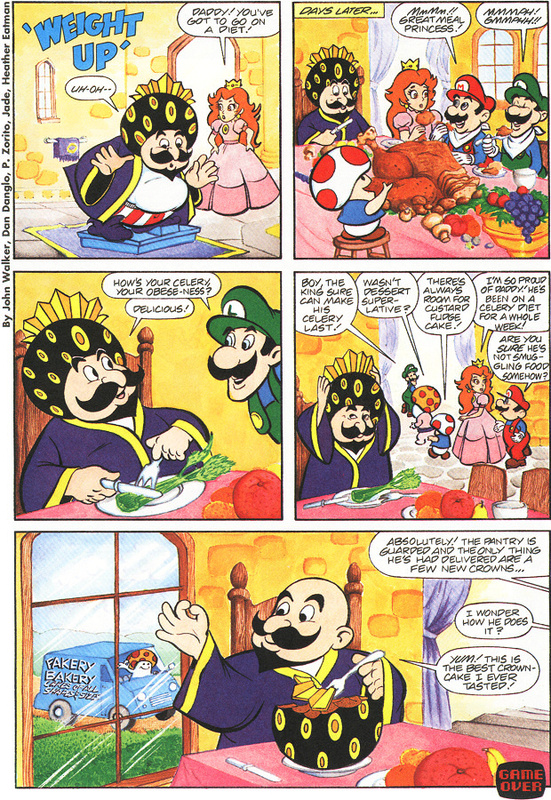 In the Nintendo Comics System, the mushroom hats came off very often. In fact, the King ordered a fake mushroom hat one time that was made out of cake. He ate it. Lizard Dude: If someone makes a cake mushroom hat and sends us a picture, I'll mail them a free SNES game of my choosing. Fire up those EZ Bake Ovens! MEGAß¥TE: For reference: 'Weight Up'. None of my comics have the hat removal, though the cartoons certainly featured it. The King doesn't count since he's human. I'm glad to see the mailbag being revived, and going back to its original every few weeks format. I felt you guys deserve it to actually receive an intelligent e-mail for once, so I was wondering, what exactly got you guys to go back to doing them more often with less e-mails. Deezer: MEGAß¥TE's TMK Mailbag Administrator v0.2. Lizard Dude: Actually it was v0.1. MEGAß¥TE: Well the original format was every week, but getting everyone on task to do that now is harder than playing Tubular with your feet. You guys know who composed the music for Super Mario USA? It's been bugging me for a while and I just now got the bright idea to actually ask around. Um.... great site, keep up the good work. MEGAß¥TE: The same as usual, Koji Kondo. He was credited as "Konchan" in DDP. I do not like to waste your guys time asking a lot of questions, so I only write when I have a question that I really want answer. So here goes. I know that the 64 DD and Phillips CD-i were disc add ons to the Nintendo 64 and Super Nintendo, but can you give me the history of both, and where you can find them. Thanks for your time! P.S. TMK is still the best Mario Page on the Internet! MEGAß¥TE: The Phillips/Magnavox CD-i was its own system, not an add-on for the SNES, though Phillips was making a CD-i compatible add-on for the SNES at one point. The details would take far too long to go through here, so I'm going to refer you to some sites with good information about what you've asked. How come Super Mario RPG didn't get that much advertisement? I mean, The last games about mario for each systems are like the best. For Super Nintendo, RPG was the last and people who played it loved it. On 64, Paper Mario was one of the last games and people loved it that they are coming out with another one. How is that last games either are good but don't get attention or People love it? I think that last games of systems are like the best. MEGAß¥TE: It seemed to me that it got a fair amount of advertisement, though I was a subscriber to Nintendo Power during the time that it came out... The last games of systems are normally better than earlier games simply because after several years of working with the hardware, the developers have learned all sorts of tricks, allowing them to design games that use the systems to near maximum potential. Unfortunately, these games are often overshadowed by the next generation of systems. Chupperson: I don't think I knew about it when it came out. I was too preoccupied with Super Mario 64. I don't think I ever saw any commercials for either of those games, however. Deezer: I remember my local Toys 'R' Us having a big "Super Mario RPG" window banner, and Nintendo Power hyping it up a lot, but other than that I really didn't pay much attention. Unfortunately, my indifference turned into boredom when I finally rented the game. Lizard Dude: Still my personal favorite. Chupperson: Boredom? What the heck? Deezer: I've noticed that Squaresoft games usually have that effect on me. I cannot find the Super Mario Brothers cartoons on DVD and VHS anywhere, and the prices on Amazon and Ebay are outrageous, so I was wondering if you can find them on P2P programs. I have Kazaa Lite K++ and I wanted to find out if anyone can find them on it. MEGAß¥TE: You can, but we don't condone that kind of activity. Also, watch out for eBay scammers... all of those "all Mario episodes" DVDs are just pirated copies likely gotten from the aforementioned P2P networks. There is hope, however. General Mills is giving away Mario DVDs in certain cereal boxes. Well I've send you an e-mail about a Mario movie I saw in Sony channel and yadda-yadda... well I just found out that the commercial wasn't real, it was a joke from the "Jamie Kennedy Experiment" or whatever is the name for that thingy... hehe I just didn't read the end where it said "Everyone is gonna be caught. Even you." XS Well, by the way, I think you guys haven't see it because I'm Brazilian, and so does the commenrcial I've seen. Pfffff I'm a loser. XD Anyway, thanks for the patience and sorry for my stupidness... No need to put it in the mailbag, I was just wanting to tell you guys that I found out the truth. MEGAß¥TE: I included it anyway so everyone can find out the truth. Thanks for the update! Lizard Dude: The truth really was out there! I know you guys have this on the other platforms section already, but I found that the Macintosh garden (http://mac.the-underdogs.org/) has for free for download for mac. i know what you are thinking "it is illegal" but it isn't! Macplay gave up the rights, so it is abandonware. abandonware is software given up by the company that made it. I hope this will help(especially you mac users) I personally don't like it too much. MEGAß¥TE: Most abandonware is still probably illegal. Unless the company puts the game out into public domain specifically, they still own the rights. I doubt that Macplay (Interplay) did that. The bigger problem here is that Nintendo would still likely have rights as well. However, the Copyright Office has said that software that is no longer readily available can theoretically be used under fair use, but this has never been tried in court to my knowledge. They probably won't come after you in any case, but that still doesn't make it legal. Hey TMK guys, after reading the last mailbag regarding VS Super Mario Bros. being released in Japan (or not) I thought I'd better calm the uncertainty. Yes, it was released in Japan. Any number of Japanese arcade game lists, Nintendo Japanese release lists, Nintendo arcade lists, Japanese Mario sites and so on all include it as a Japanese release. While the US got a lot more VS games, Japan got a small handful, and VS Super Mario Bros. was the last one over there. However, they do all list it as released in 1986 (as does the game copyright), so it was definitely AFTER the Famicom release of Super Mario Bros. I can't be 100% sure, but I think it probably came out just before Super Mario Bros. 2 (J) on the Famicom Disk System... paving the way between the two titles. Some VS games were released before their respective Famicom versions in Japan, such as VS Balloon Fight, but VS SMB was not one of them. I don't visit Japanese fan sites regularly, but right away I came across these two that specify "overseas release" for VsSMB. Hey. I've been working at this 2-bit Nintendo site called NGEB for a million years now, and we thought we might spice things up by adding a radio channel (much like WTMK) to our features. Now, other than "we'll host an online radio station for only $19.99 a month" sites, I haven't found anything in the way of a "do it yourself" guide to setting up our own station. How did you guys do it? We've got plenty of server and traffic space to use up, so using our own server wouldn't be out of the question, if that's what you guys do. Deezer: Our stream is hosted by http://radio.emulationzone.org/ ('Zone Radio Network). I have no experience with "do it yourself" either. Glitches are interesting things, don't you think? Recently, I discovered a glitch in Super Mario Sunshine that bypassed the "fall forever" barrier in Pianta Village, and I've got some crummy, unaltered but still great screenshots to prove it! Sorry, I don't have a method to make them really high quality. Anyway, you'll probably want to know how I got below the huge stone base. I fell off to the south edge of the stone base, just east of the bridge. 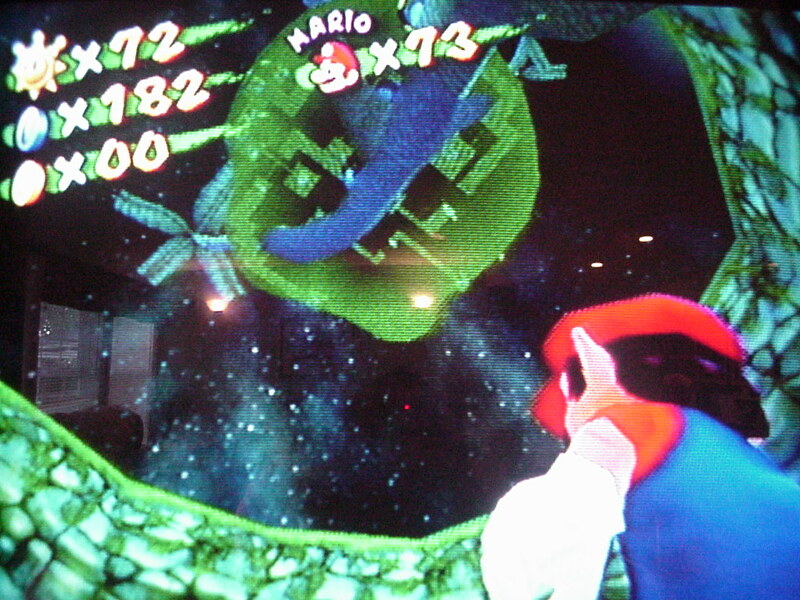 Being angry from not finding any blue coins earlier, I half heartedly hovered, and then let Mario fall down the base of the giant palm tree to the darkness below. 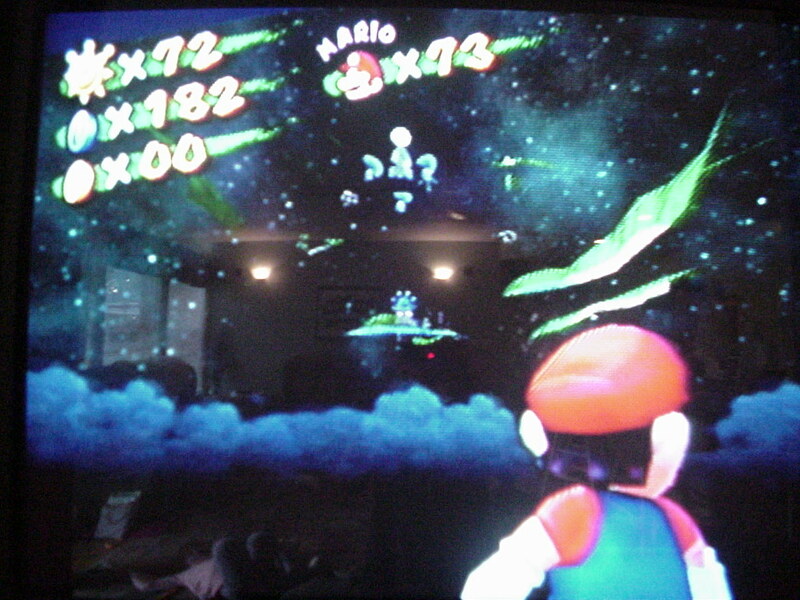 But much to my surprise, Mario continued to slide down the tree, and down onto the black Z=0 base. If you want to replicate this glitch on your own, go ahead and try, but I doubt the odds of success are worth it. Well, that's fascinating. Another glitch. Anyway, when do you think Nintendo will come out with a new game starring Luigi-- perhaps in Sarasaland? Hopefully, not in another "vacation" based plot. Goodbye for now.